Posted on February 9, 2016 by Billy S.
One of the most popular features of Formsite accounts is the built-in email notifications available at all service levels – even Free. The ability to send emails every time the form is submitted is, for many form owners, the most important part of the process. After all, with the ability to send multiple notifications in multiple formats with conditional logic, your form becomes the smart and automated leader of your communication and data collection programs. Every time your form is submitted it sends your entire list of notifications. If you have conditions set to limit sending, those are evaluated during the send. Sending multiple notifications is as easy as clicking the New button and making a new notification with your new content, recipient, or conditions. The To address can either be defined on this page or from your form by selecting the option from the dropdown list on the To field. One of the most common uses for multiple notifications is to send one email to the form visitor as a verification of submission and another to the form owner informing them of another form result. 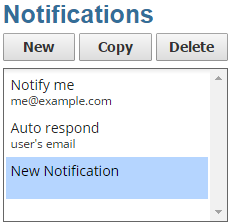 To do this, add an Email Address item to your form and select that item as the To address, then create a second notification using your admin email address in the To field. Use the notifications to keep the team or department in the loop. Add email addresses in the notification To box separated by commas and all addresses will receive an identical copy of the notification. Use the conditional logic tools to send only the necessary messages to each person. Combine with Results Views to create a truly smart notification system. Create a new email account and send a copy of every submission for future reference. If part of your process is to regularly clear out your results table, having a backup of every email can come in handy. Similar to the text option above, there are services that allow you to send an email to post an update. From IFTTT to Zapier, there are services that can take your email and post it automatically to your social media account. For example, you can configure your donation form to send a tweet with every donation over a certain amount.